For other uses, see High tech (disambiguation). High technology, or high tech (sometimes also called frontier technology or frontier tech) is technology that is at the cutting edge: the most advanced technology available. The opposite of high tech is low technology, referring to simple, often traditional or mechanical technology; for example, a slide rule is a low-tech calculating device. The phrase was used in a 1958 The New York Times story advocating "atomic energy" for Europe: "... Western Europe, with its dense population and its high technology ...." Robert Metz used the term in a financial column in 1969: "Arthur H. Collins of Collins Radio] controls a score of high technology patents in variety of fields." and in a 1971 article used the abbreviated form, "high tech." 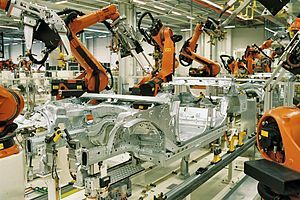 A widely used classification of high-technological manufacturing industries is provided by the OECD. It is based on the intensity of research and development activities used in these industries within OECD countries, resulting in four distinct categories. Startups working on high technologies (or developing new high technologies) are sometimes referred to as deep tech. Look up high tech in Wiktionary, the free dictionary. ^ Cortright, Joseph; Mayer, Heike (January 2001). High Tech Specialization: A Comparison of High Technology Centers (PDF). Brookings Institution, Center on Urban & Metropolitan Policy. ^ "Atomic Power for Europe", The New York Times, February 4, 1958, p. 17. ^ Metz, Robert (1969). "Market Place: Collins Versus The Middle Man", The New York Times, April 24, 1969, p. 64. ^ Metz, Robert (1971). "Market Place: So What Made E.D.S. Plunge? ", The New York Times, November 11, 1971, p. 72. ^ Hatzichronoglou, Thomas: "Revision of the High-Technology Sector and Product Classification", OECD Science, Technology and Industry Working Papers, No. 1997/02, OECD Publishing, Paris.